Merry Christmas to all of you! As I write this message I think about how I am so blessed with good health and love of family and friends and my Stampin' UP! business. Thankful to be able to celebrate the birth of Jesus. I try to make my tags personal each year, this year our son Eric and his wife Chrissy went to Europe for vacation and when I saw the English phone booth in the SAB "Feeling Sentimental" I knew I had to have it. So instead of putting their names on their packages I put the Eiffel Tower in the Artistic Etchings set for Chrissy's presents and the English phone booth for Eric's presents. In previous years I have cut their initials from the big shot and used that for their tags. I just wanted to share in some of the ways I incorporate my love of stamping in our Christmas celebrations and our home. This is a fun Christmas video by the talented staff at Stampin' Up!. If you love the big shot as much as I do, you are going to love the new Pop N' Cut die. 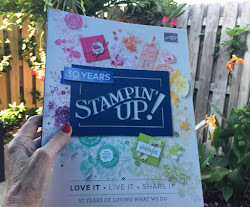 Watch this video for the newest die from the Spring Stampin' Up! catalog. 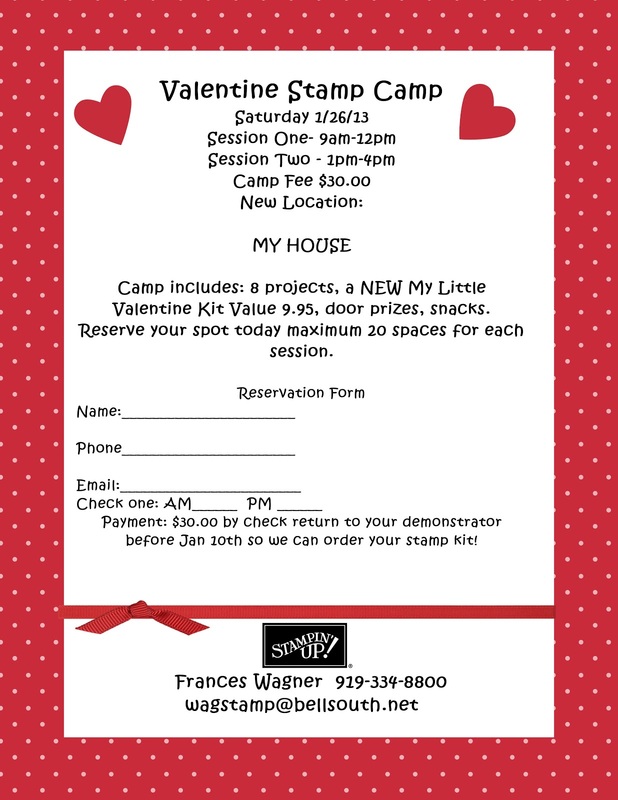 Don't forget to sign up to come to my Valentine Stamp Camp so you can use this fun die. It will be one of our projects. 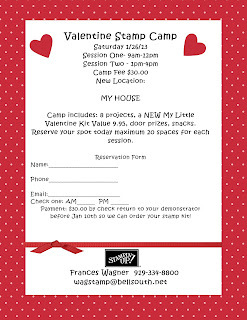 Labels: Big Shot, Frances Wagner, Pop n' Cut Die, Stampin UP, Valentine Stamp Camp. Today was my team Christmas gathering. We had a meal together exchanged gifts and stamped a little. This beautiful Swallowtail Butterfly is from our Spring Mini Catalog is our make and take for the day, it is so beautiful. I used pool party and whisper white for my colors here. Recently on Pinterest I saw an old envelope enlarged and framed and I knew I had some love letters from my husband in 1968 and I came across them last week and decided to enlarge one of them and frame it for him for Christmas. I loved the way it turned out. I put a punched out heart to the dot over my i in Miss. I also added some ribbon to hide the edge of the envelope. I hope you like it. :) By the way look at the writing under the postage stamp...(Notice the stamp is upside down) that means I love you. How sweet, even back then, I am so blessed. For the record I did not have the black line in the picture but thought I needed to black it out. 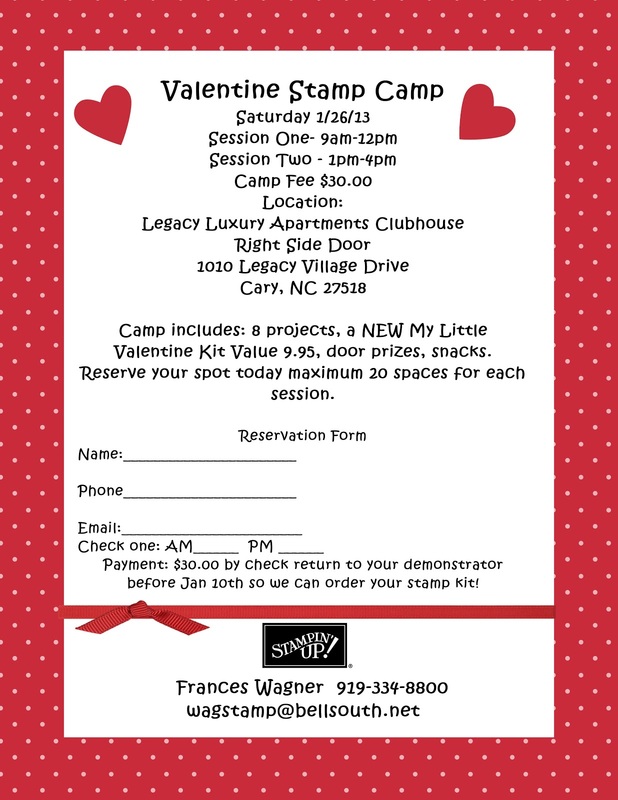 Stay tuned for Valentine Stamp Camp Coming soon! 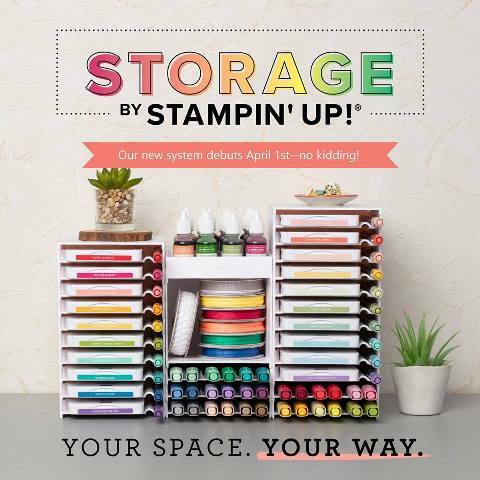 $125 in stamping products (they can even choose brand-new spring catalog products)! A collection of TEN full-size ink pads (a $50 value)! 2 DAYS LEFT.... CONTACT ME TODAY IF YOU WOULD LIKE TO JOIN MY TEAM! * Qualifying Clearance Rack orders are eligible for Hostess Benefits/Stampin rewards! * Only online orders qualify for this promotion. Feel free to order both Clearance Rack and non-Clearance Rack items on the same order-we're flexible like that! * There is no minimum purchase required to participate in this special offer-go nuts! * Clearance Rack Blitz items are only available while supplies last-so don't wait! And sorry, but there are no refunds or exchanges on Clearance Rack items. 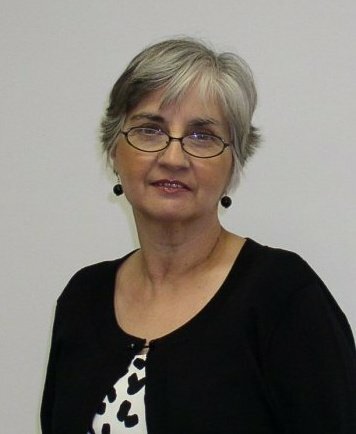 * Check out my on line store HERE! Labels: Clearance Rack Blitz, Simply Scored Borders, Stampin UP.